Many organizations and individuals want to find and adapt relevant promising practices from others, but few programs are replicable in their entirety. 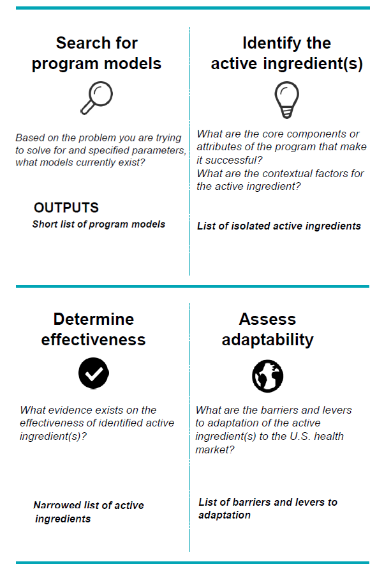 What appears to be missing is a way to connect the dots, a tool to move beyond traditional ways of thinking about innovation as linked to a program as a whole and instead, begin to think about how to isolate the active ingredients – or the program attributes core to achieving the programs’ outcomes. Few programs are replicable in their entirety, so how can we answer the question: what are the aspects of the programs that can be isolated and analyzed for adaptation to address a similar problem in a different context? The Adaptation Framework provides a set of flexible and adaptable guiding principles for identifying program activities that have the potential for knowledge transfer and impact. It guides users to crack the program open and look at the core program attributes crucial to achieving the program’s outcomes – what we call the “active ingredients”. The ultimate goal is to find a set of active ingredients that can be adapted to address similar problems in different contexts. To access this resource, please click the link below. The guidebook is an accompanying report to the Adaptation Framework that offers sample active ingredients for consideration, an illustrative case study, as well as more detailed descriptions, examples, and optional tools and documentation that may be used when applying the Framework to identify potentially adaptable models for the United States. To access this resource, please click the link below.